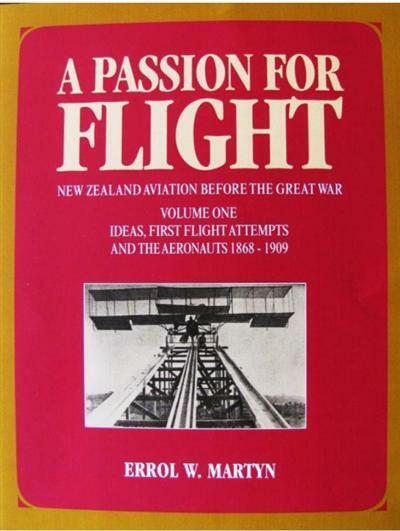 Volplane Press in association with the Aviation Historical Society of New Zealand is proud to announce publication of the first volume of Errol Martyns new trilogy - A PASSION FOR FLIGHT, a history of New Zealand aviation before the Great War of 1914-1918. This definitive work pr... read full description below. 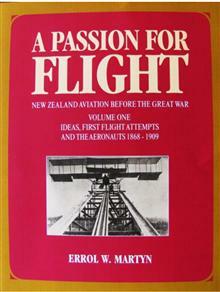 Volplane Press in association with the Aviation Historical Society of New Zealand is proud to announce publication of the first volume of Errol Martyns new trilogy - A PASSION FOR FLIGHT, a history of New Zealand aviation before the Great War of 1914-1918. This definitive work presents for the first time a detailed record of all known New Zealand-related aeronautical activity of the long-neglected pioneering period of 1868-1914. The complete trilogy will undoubtedly become an indispensible first place of resource for historians, aviation enthusiasts and genealogists alike. The 184-page first volume takes the story up to 1909. It includes eye-witness accounts and over 100 illustrations, many of which are published for the first time. There is comprehensive coverage of the daring balloonists and parachutists aeronauts both local and from abroad (including fascinating American sisters Millie Viola and Leila Adair) the first people to be seen in New Zealand skies. One of of the New Zealanders, in a balloon of his own design, established the countrys first duration and cross-country flight records. All known patents, flying machines designed, constructed or trialled aerial events and the personnel involved are described in detail. (It is generally not realised that some 70 patents were applied for and more than 30 gliders or aeroplanes were completed or begun in New Zealand by 1914.) The final chapter also puts to rest once and for all the controversial claims made for Richard Pearse as having flown before the American Wright brothers. It brings to light new information about him and his flights attempts that has been overlooked by previous researchers. Included is a lengthy and enlightening interview with the inventor himself! Four appendices, over 400 footnotes and a comprehensive index complete the book. Volumes Two and Three are to be published in 2013. Volume Two will cover the activities of the first aero clubs, aeroplanes, aviators and aeronauts of 1910-1914. The third will also cover the 1910-1914 period, presenting the full story of New Zealands first professional pilot and our most accomplished aviator of the period Joseph Joel (Joe) Hammond. It will also reveal new information about, and set in proper context for the first time, the beginnings of military aviation in New Zealand and the activities of New Zealanders involved in this sphere abroad.